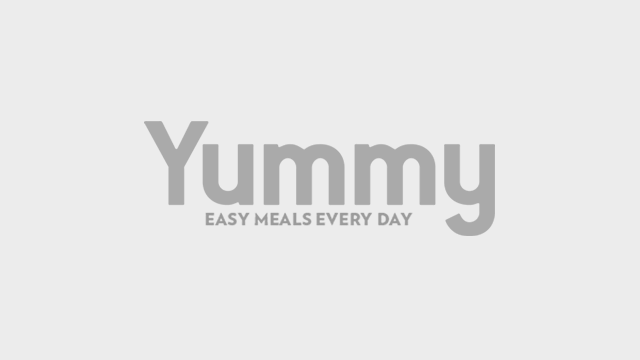 This menu is good for big families and small dinner parties. Whether it's a dinner party for two or 10, you don't need to stress over what you're going to serve and whether it's going to meet your guests' standards. Just like any dinner party, the goal is for everyone to have a great time. 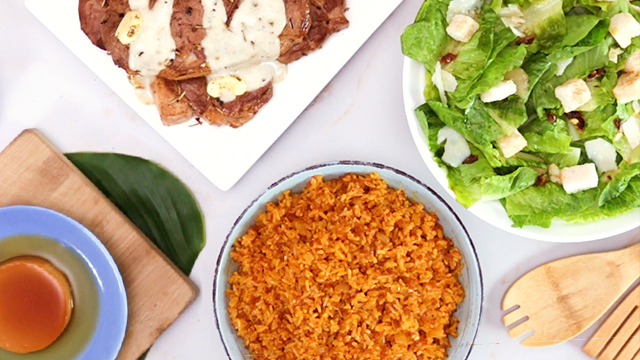 This salad recipe uses tuyo and calamansi, which means the ingredients are easy to find. To cut your costs even further, swap out the olive oil for vegetable oil. 1 In a large bowl, gently toss croutons, 5 tablespoons olive oil, 2 1/2 tablespoons Parmesan cheese, and salt. Place on a baking sheet and toast at 375 degrees F/190 degrees C until lightly browned. Set aside until ready to serve. 2 Place eggs in a bowl. Pour enough hot water to cover the eggs. Let them cook for a couple of minutes. Drain the water and rinse under cold water. Break the eggs in a bowl and separate the yolks from the whites. Transfer yolks to a large bowl. Discard egg whites if desired. 3 In a large bowl, add tuyo fillets, and finely mash with a fork. Add garlic, calamansi juice, Worcestershire sauce, and remaining Parmesan. Top with the egg yolk. Whisk with a fork until well mixed. Drizzle olive oil in a steady stream while whisking until it is well mixed and has a thick consistency. 4 Break romaine lettuce into bite-sized pieces. Add romaine lettuce to the dressing and gently toss. Divide among plates. Add croutons and top with more Parmesan. Serve immediately. You'll enjoy these pork steaks as you would the more expensive beef steaks, complete with savory sauce. 1 Season pork with salt and pepper on both sides. Cover with rosemary and garlic. Let them sit for at least 15 minutes. 2 Melt butter and heat vegetable oil in a pan over medium heat. Add pork and cook the meat on both sides. Drizzle with butter. 1 Melt about butter in the pan. Add pepper. Sprinkle flour and stir until it is cooked. 2 With a wire whisk, mix beef stock and milk. Cook until the mixture has thickened. Pour beef stock into the gravy. 3 Season with nutmeg, salt, and ground black pepper. Remove from heat. This java rice recipe is delicious on its own but even better when served with a hearty serving of ulam. 1 Heat oil, add atsuete seeds, and let rest for 20 minutes. Use the annatto oil to saute onions and cook until translucent. 2 Add pork. Season with salt and pepper. 3 Add rice and liquid seasoning to the mixture. Mix well. Its creamy, luscious texture is the perfect way to end the evening. 1 Make the caramel: Place sugar and 1/4 cup of water over medium heat. Cook until thick and golden brown in color. Pour into molds and set aside. 2 Dissolve coffee granules in the evaporated milk. Gently stir the evaporated milk into the condensed milk until fully incorporated. 3 Stir egg yolks until smooth. Pour into the milk mixture, along with the vanilla and salt. Whisk gently until combined. 4 Pour the egg mixture through a fine sieve into the molds. Cover with foil and steam for 20 minutes, until a toothpick poked in the center comes out clean. Alternatively, bake in a water bath for 40 minutes, until a toothpick poked in the center comes out clean. 5 Let cool to room temperature and run a knife along the sides of the flan to loosen it. Flip onto a plate to serve. When shopping for parties, you can manage your expenses and spend with ease by using your BDO Debit Card. Just dip or tap for your purchases in-store. You can also use it online*. Don't have a BDO Debit Card yet? Visit any BDO branch near you to apply or click here for more details. This article was created by Summit StoryLabs in partnership with BDO Debit Card.